Happy Easter everyone. I love this Stampavie image and wanted to create another Easter card. This time I used my Zig Markers to color the image. This card was on the Kuretake-Zig blog last week. Close up of the stamped image. The Wink of Stella Pens adds some nice glitter to the egg. Hi everyone. I have a post up today on the Scraperfect Blog. I used Zig Markers to color the reverse side of the vellum. Then used Faber Castell Gelatos to color the background on the front of the vellum. The best adhesive to adhere vellum is the Best Glue Ever from ScdraPerfect. Check out my post to see why I love this stuff!!!! Hi everyone, my challenge this week at Cornish Heritage Farms is to create your own pattern paper. With the large variety of stamps available at CHF, this is so easy to do. I used the Large Dots Backgrounder stamp to create one background, stamping it in brown ink onto blue cardstock. Since I used a textured cardstock, I was able to get a rustic look. 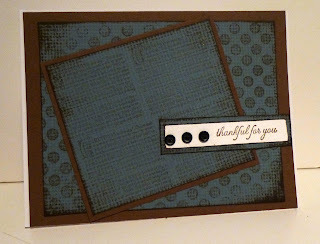 To create the second background I used a stamp from the Night Before Christmas stamp set, and I just repeatedly stamped the phrase until the cardstock block was covered, again using brown ink on blue cardstock. Since the cardstock is textured, it is not so easy to read the stamped phrases. But, as my intent was not to create a Christmas card, I was absolutely thrilled with the result. So don't be afraid to use theme specific stamps in your every day stamping - you could be surprised at what you can create. 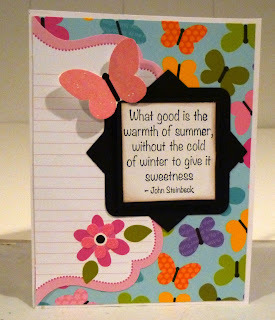 The sentiment is from the amazing Script Essential Expressions stamp set. Thanks for stopping by today and don't forget to stop by everyone's blog for more inspiration. Good morning, it's Monday so time for another Prickley Pear reveal. 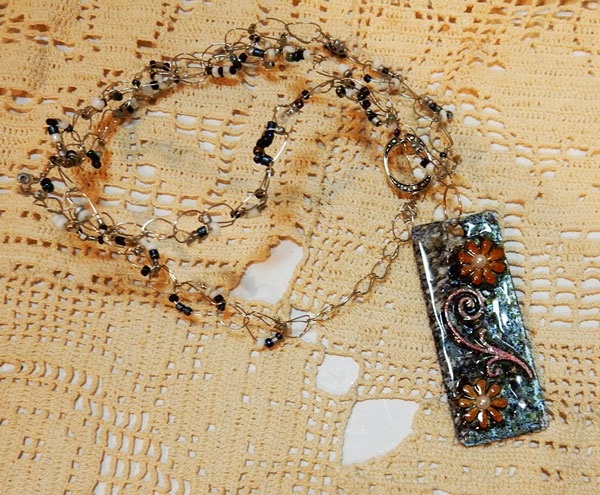 Be sure to stop by the Prickley Pear blog to see what all the designers have been creating. Today I used the Spring Flourished Ovals (CLR033) along with the Flourished Oval Die (D033) which is made to fit the stamp perfectly. I added a little color to my image with Zig Markers. With Easter so close, I thought I'd create another card with this wonderful Stampavie image. I used some yummy papers from Papertemptress. There are some awesome papers in the store that you need to check out. I colored the imaged with Copic Markers. Check out my complete post on the Papertemptress blog. It's been a crazy month and I neglected to post my February projects for Prickley Pear Rubber Stamps. Stamp/die: CLR032 Spring Crosses Clearly Beautiful Stamp Set, D032 Cross Die. Remember to stop by the Store to find these wonderful stamps and so much more. Today I used the Duck with Bib stamp and made him the focal point of my card. I colored him with Zig markers and mounted him on a scalloped circle before adding him to the card. I think this would make a great baby card. I also created this bunny tag using FF0153 Bunny with Daisy. Wouldn't this be cute on a gift bag for Easter? 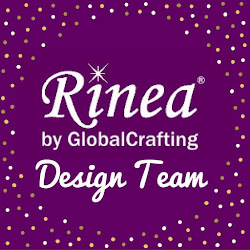 I love the CLR033 Spring Flourished Oval stamps and the matching die D033 because they create the perfect imagery for a card. This week the Scor-pal designers are showing an assortment of boxes that can be created with the Scor-pal. 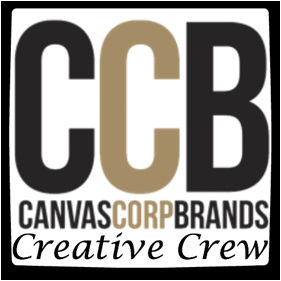 Stop by and see what we've been up to. This is a snippet of my project which you can find here: Scor-pal. Do you realize that Easter is only 2 weeks away!!!! I can't believe how early Easter is this year, and so it's crunch time to get those last minute Easter cards created. I've created a tutorial on creating a window card which has been posted on the Classy Cards n Such Blog. 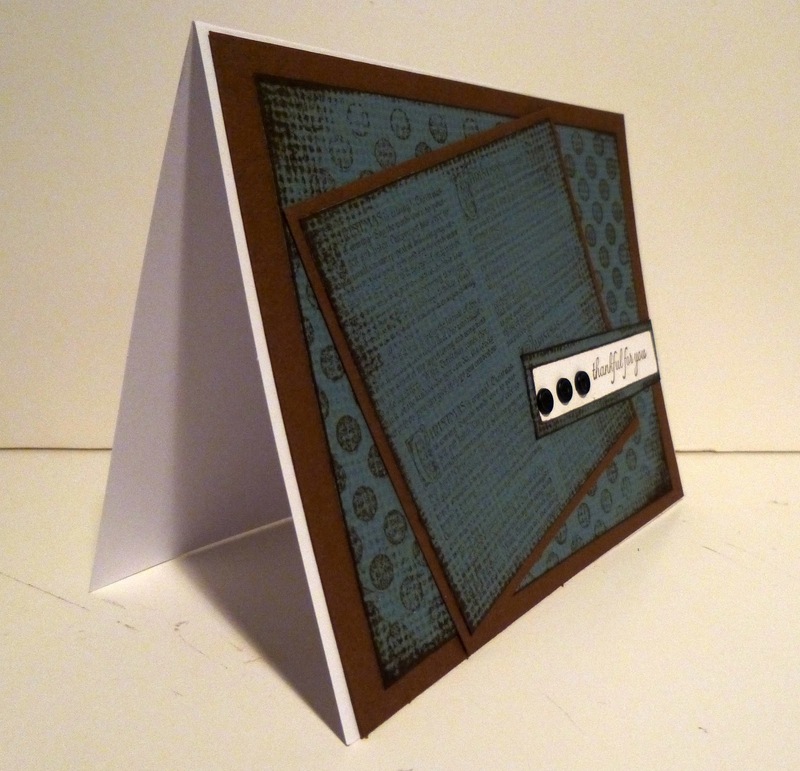 I started by creating a 5 1/2" square card from Wausau Index Green Cardstock. Then I cut a sheet of paper from Webster's Pages Trendsetters Paper Pad slightly smaller than the card and adhered it to the card base. Tape the 4th largest Spellbinders Labels Eighteen die to the center of the card front. Unfold the card and run it through your die cut machine. Because of the additional layer involved, you may need to add a shim to get the perfect cut. Tape the Spellbinders Fancy Tag to the Wausau cardstock and stamp a sentiment from the Justrite Hugs & Kisses Stamp set inside before die cutting. Stamp and color Stampavie's Chirpy image and color with assorted Copic Markers. I added some glitter to the dots on the Easter egg with a Sakura Gelly Roll Pen. 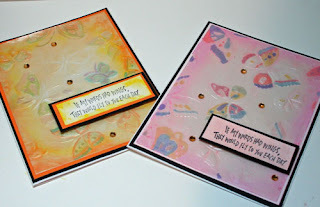 Once colored, I used the largest Spellbinders Labels Eighteen die and cut out Chirpy. I then centered the image through the window and adhered it to the card. I added the sentiment to the card front with Joy Foam Adhesives along the edges so it would stand apart from the image. Happy Easter and thanks for stopping by today. All the supplies needed to create this card can be found at the store. Check here and take advantage of the Easter savings. Hi everyone. Had this card posted on the Classy Cards blog this week. This awesome Antique Lantern Stamp set is from Heartfelt Creations and it's a nice deeply etched rubber cling set that stamps amazingly well. While I love Copic Markes, I decided to try out Distress Markers this time. So I stamped the image on white cardstock, then colored it with an assortment of Tim Holtz Distress Markers in Antique Linen, Bundled Sage, Fired Brick, Forest Moss, Old Paper, Mustard Seed and Rusty Hinge. Using a Water Brush I picked up the colors and colored the image. I used Vintage Photo and Rusty Hinge Distress Ink around the image and the sentiment. I love the vintage-y look of this card.. 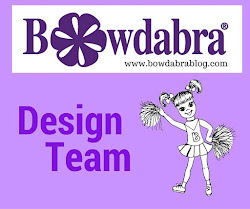 I have a post up today on the RubberBuggy blog. What an awesome Stampavie stamp - I colored them with Copic Markers. It's a new challenge at Cornish Heritage Farms, and Frances has asked us to create a card for the men in our lives. I used the Trees Backgrounder stamp which I stamped on green cardstock with green ink. I wanted to create a tone on tone effect. I also used a sentiment from A TIme to Stamp set. Thanks for stopping by today. Please stop by everyone's blog today for more inspiration. It's Monday reveal at Prickley Pear Rubber Stamps. Come and see what the designers have been creating. 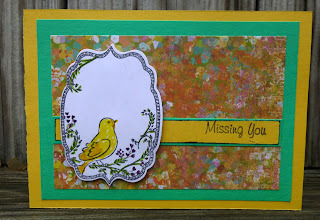 I used the Spring Flourished Ovals Clear Stamps and Flourished Oval Die. I'm thinking this would be a great gift tag to hang from a gift bag. 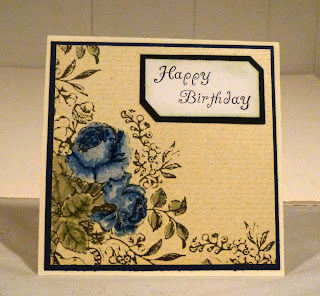 I stamped the birthday sentiment repeatedly across the tag then lightly inked around the tag with distress ink. 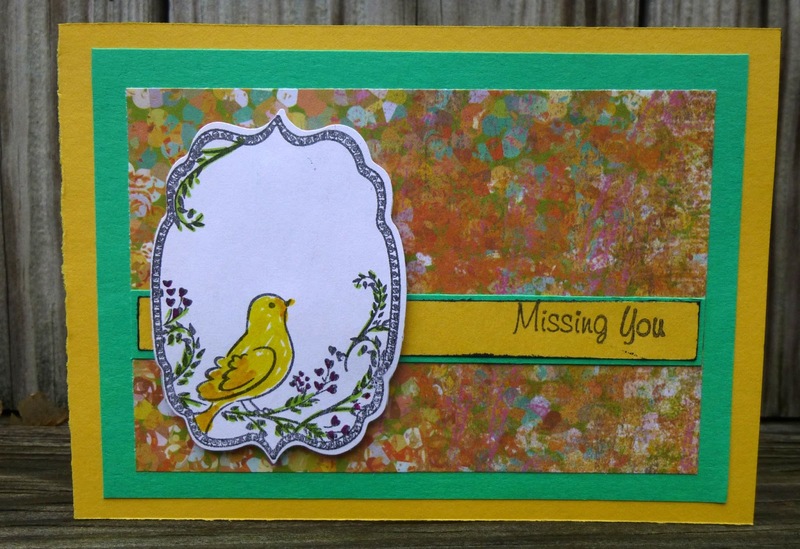 I stamped and die cut the image and lightly colored the flowers and birds with Zig Markers. wonderful papers from the Papertemptress. The summer scene is from an old Stampin' Up stamp set. I colored the image with Ranger Distress Markers, then die cut a Spellbinders window and placed it on top. I created a step card from Bazzill cardstock and added strips of Papertemptress cardstock which I embossed and inked before adhering. The swirls were cut from my Cricut Expression. It's another week to show off what we've been doing with the awesome Thomas Kinkade stamps at Cornish Heritage Farms. First I stamped the Guardian Castle with Clearsnap Chalk Ink. Wanting a different look on this card, I tore the edges and gently colored the background with Faber Castell Gelatos in blues. I tied some ribbon around the card before adhering the image on top. 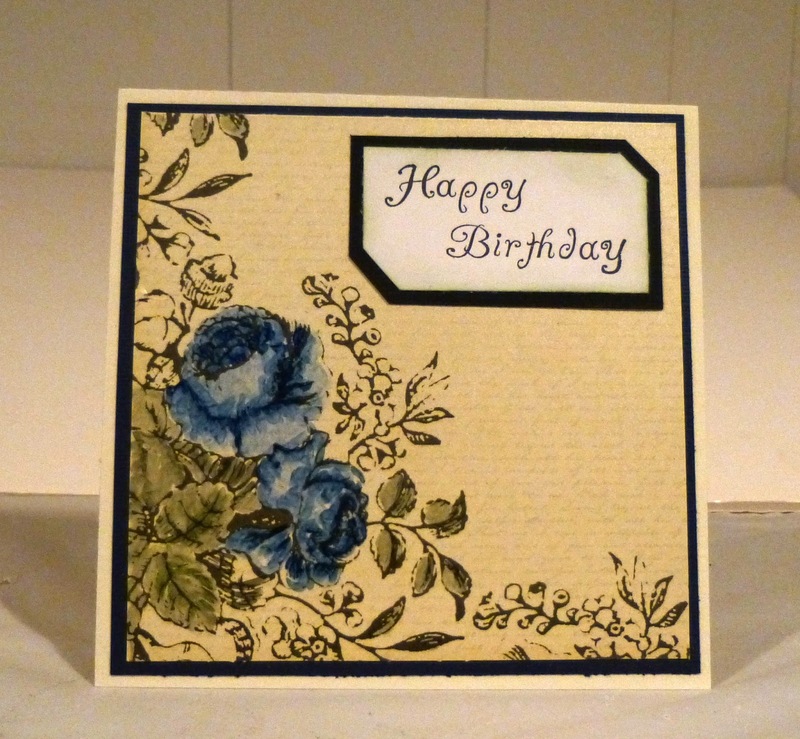 The sentiment is from Script Essential Expressions which I stamped in blue ink and added to the interior of the card. Today, I decided to work with Globecraft Memories bookboard bezels and Floral Flourishes to create a new piece of jewelry. 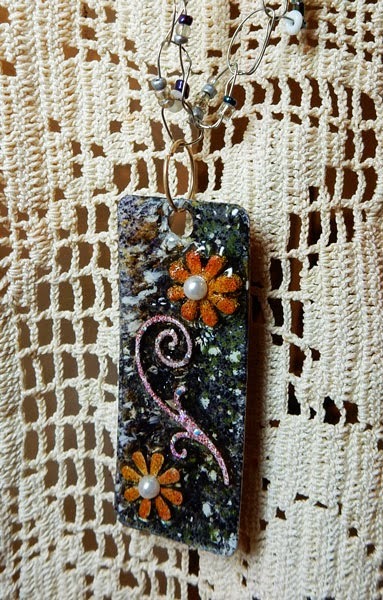 I am by no means a jewelry creator, but this necklace was fun to create. I coated the flourishes with Cranberry Wine Enamel Powder. I find it easier to coat the smaller pieces by dunking them directly into the jar, heat setting and dunking again. The bookboard bezel was coated several times with Temple Stone Embossing Powder. Since this is going to be a wearable piece of jewelry, I needed to coat both sides. Once side one was completed, I flipped to side two. The fun look I was able to achieve occured because the heat penetrated the other side and when I picked it up, the heated powder moved around on my craft sheet. I coated the flowers with Real Rust Embossing Powder then placed the flowers and the flourish on the bezel. I added a light layer of Glastique over the entire piece. Once dried, I added a second layer. 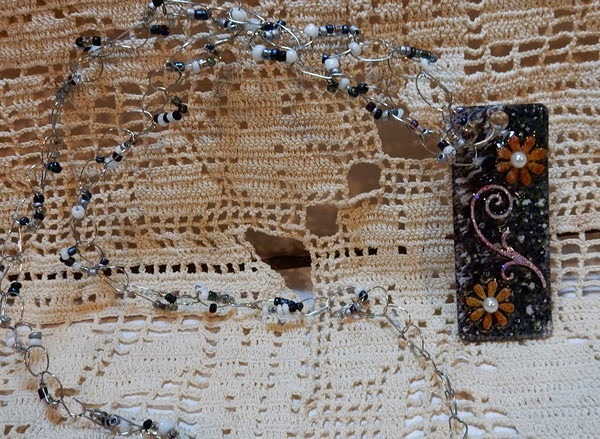 While waiting for it the dry, I crocheted a necklace using wire and seed beads. A close up of the necklace - I added small rhinestones to the flower centers to finish them. Good morning, Steph here with a cute and quick Valentine's Day project. This is based on a Project that Kitti Franken created for Scor-pal. Cut cardstock 3 1/2" x 7"
With the short side at the top of the Scor-pal, score at 1" and 2 1/2"
Assemble the hearts as shown.